Winter is almost over, unless you live in the northern part of the US or Canada, in which case you may have another month or so of snowy weather to contend with. 😉 This crochet super scarf is sure to keep you, your spouse or even your older kids and teens warm whatever the weather throws at you! Because it is just over 9 feet long, you can wrap the crochet super scarf multiple times, or even worn as a hooded scarf with some modifications (see the “additional notes” section for instructions). 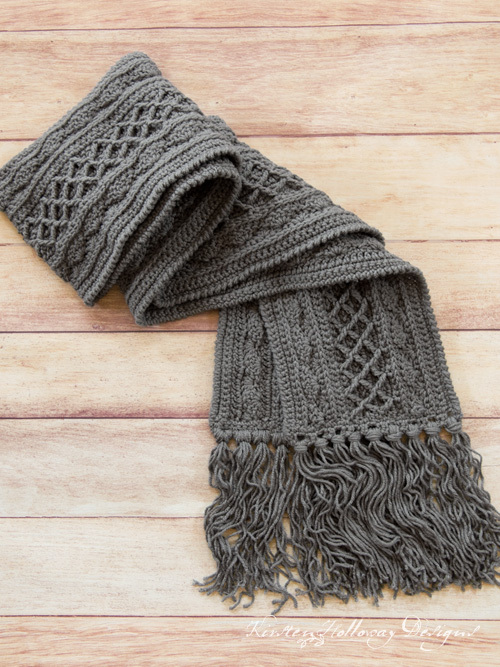 There’s no excuse for staying indoors with a super scarf like this to keep you cozy! With a little convincing I got my 12 year old camera-shy son to model for me, and it could be because I’m his mom (I’m allowed to have biased opinions, right? ), but I think he looks very fashionable in this scarf. He even styled it himself, and tried to pose like I do–the little ham! You know there’s a big cheesy, dimpled grin under that scarf. Aren’t kids great? Keep scrolling down to get to the free crochet super scarf pattern, and when you finish crocheting this scarf, I’d love for you to drop by my Facebook group and share a picture of you, or your family members wearing it! If you want to make a set, then check out my free Snow Country Ski Beanie. -Crab Stitch (also known as the reverse single crochet). Form this stitch as you would make a normal single crochet. However, at the end, you go backward. Then you work your next crab stitch into the previous stitch, and not the “next stitch” (ahead). If you get stuck, check out this helpful video from Moogly. -hdc in the 3rd loop: Look at the top of the stitch, and locate the sideways “V”, bend the stitch to look at the back, and you should see another “V”. You’ll be working into the back loop of that “V”, this is called the 3rd loop. When you are working in rows, this 3rd loop will be facing you after you turn! Here is a video that explains where this is if you get stuck. -The crab stitch edging is optional, but will give the crochet super scarf a more finished, professional look. Some people may find their edge is more even when they go down a hook size or two for this step. 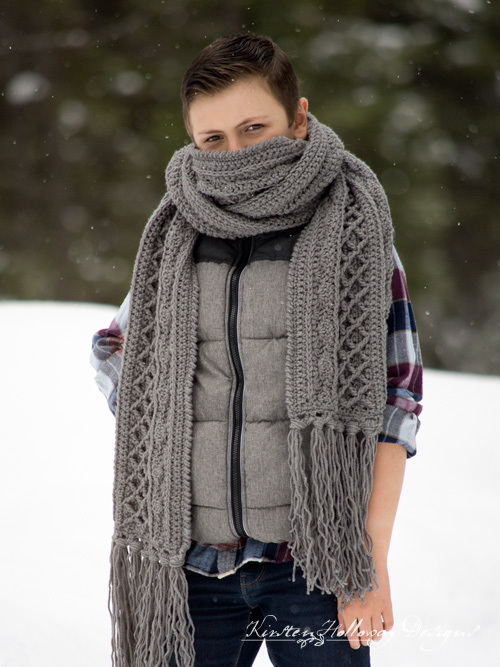 -This scarf can be made into a hooded scarf! When you’re done, fold your scarf in half, and sew the back edges together down about 12 inches to create a “hood”. -This scarf can also be turned into an afghan! Start at row 1, then once you get to Row 21 repeat rows 5-21 until your afghan is the length (width) you want, and then finish with rows 22 and 23. Add the edging of your choice once you’re done. Repeat this sequence on the other end. Loop 6 24” pieces of fringe through each hole on the ends. If you want shorter fringe, feel free to cut 12″ or 18″ lengths. Repeat this section at the other end of the scarf. Working along long edge of scarf with front side facing you, attach yarn to top edge of scarf, crab stitch along the edge. Fasten off when you get to the end. Attach yarn to bottom edge of crochet super scarf, crab stitch along that edge. Friends, if you enjoyed this crochet super scarf pattern, then don’t forget to sign up for my newsletter here! That way you’ll never miss out on special events, or freebies I’m offering. Sharing a link to this post with your friends is also always appreciated! You are welcome to share the link to this crochet super scarf pattern, using one image of your choice, on your site, but please do not share the written patterns themselves, or use additional images. If you sell finished items online, then please do not use my pictures for your listings. I’m positive that your work is of high enough quality for you to sell the finished piece, so have confidence in your abilities! <3 Thank you! I made this crochet super scarf pattern so individuals, and small business crocheters alike can use it. So, selling your finished pieces in boutiques, at farmer’s markets, craft shows and other events is encouraged! However, I do require is that you not use it commercially to produce millions of copies. 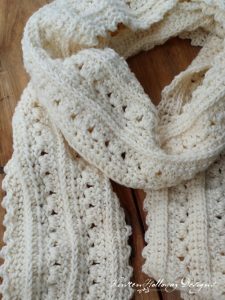 This crochet super scarf post contains affiliate links. When you purchase something using these links a small percentage of the sales price goes to me. However, you do not pay any extra for the item you purchase. How cool is that?! If you liked this pattern, then have a look at my hats! Beautiful scarf, thanks for sharing! Would it be possible to see a picture of what the reverse side looks like? I’ve uploaded a picture of the scarf by itself which shows a little sliver of the back. It’s beautiful!! Well done and thank you for the pattern! Hi, i love this pattern! However after row 11 I did dc in each stitch across and my stitch count has gone up by about a third! I don’t know what I’m doing wrong! Should I not be dc-ing in every stitch? Hi Tiff, are you remembering to skip the stitch where the FPtr goes in row 11? If you’re not skipping that spot it could make your stitch count increase by 1/3 in row 12. I hope that helps! Keep scrolling down the page and you should see it, Judy. 🙂 I promise it’s there! Is there a sc in 3rd loop row missing after row 17? Before the shells row? This pattern is beautiful. I can’t wait to show you my scarf! Oops! Sorry about that! My original Row 18 must have had a rebellious streak and skipped town. I’ve put him back in his place. 😉 I’m glad you like the scarf! I can’t wait to see yours! Hi, I love this pattern, thank you. Row 4 and 6 gives a texture. I see the row 11 front posts give the texture on the wrong side of the scarf ( not on the side r4 and 6 ) but in the picture the textures are on the same side. Where am I going wrong? The textures should be created by even rows right? The only thing I can think of is that maybe you might be working in the wrong 3rd loop. You’ll be working in the 3rd loop that is at the back of the stitch, however, once you turn, that loop will be facing you. Hopefully that helps! Wonderful! I’m glad you got it figured out! Well, I’ve searched up and down, on the scarf and the hat, but I can’t find a print link! On March 12th, when Judy asked how to get the free pattern, you said “Keep scrolling down the page and you should see it, Judy. 🙂 I promise it’s there!”. What did that mean? The instructions for the bottom part of the hat are in my website. Keep scrolling down the page to get to them. You will see them written out on the site. I dont understand row 11, you have to do a FPtr in the second sc of row 9. I understand this part. But than you have to make the second FPtr of the FPtr2tog in the 4th sc of row 9. But the patern says you have to skip 3 sc. Than you have to make the second FPtr of the FPtr2tog in the 5 sc in row or start with the first FPtr in de first sc in row 9. I cannot find a link ANYWHERE on this page…I am stuck on row 11. I’m left handed. I cannot figure out this diamond stitch at all. Can you please post a link? Or I will be forced to RIP this all out and do a completely different scarf and I really wanted to do this one. Hi Kim, I’m sorry you’re having a hard time. Try this video. It’s right handed, but it may give you an idea of what is supposed to be going on. https://www.youtube.com/watch?v=nUl5SLtNRDo You may also try searching for “crochet diamond stitch left hand” to see if any left-handed tutorials come up. I hope that helps! Thank you soo much!! I appreciate this more than you know! I just love this scarf!! I love this scarf and can’t wait until I’m finished! However, I am confused on row 11. Am I supposed to be working on the wrong side? I got to this point before and then took it apart and started over and I’m still getting the same thing! I’m having the same problem. After completing all 10 rows the 11th row starts on the wrong side… The only way I figured to correct this is take out row 9, don’t do a row of sc stitches but rather jump into the dc stitches, so row 11 ends up on the right side. I’ve been asked to make this for a friend. Fingers are crossed that I’m advanced enough to achieve such a stunning scarf! However, I’ve scrolled from top to bottom, bottom to top at least five times and simply can not find the link to click for the pattern. He won’t mind paying for a PDF file but would you please highlight for others and myself the exact link for the free copy? I’ve read all the comments and feel downright foolish that I am apparently overlooking it. I hope that clears up any confusion! Good luck making it! I love your pattern and can’t wait to get started! However, I’m making it for my Brother-in-law and he’s 7′ tall (no joke)! I’m thinking I’d like to make it even longer; how many stiches would I need to increase the foundation chain and by approximately how much would it increase the length? I don’t expect you to figure out the precise length for me, but knowing in advance how many stitches for each pattern repeat would be greatly appreciated! Thanks in Advance!! This scarf is worked in multiples of 12+1, plus 1 for the beginning chain (that info is listed in the “Additional Notes” section for easy reference). You can use my gauge information (11 hdc or sc stitches in 4″) to figure out roughly how many stitches are in a foot and calculate from there. 🙂 All the information you need to do this should already be included in the information listed before the pattern instructions. 😊 Good luck on the adjustments! This is exactly the information I was going to ask! Thank goodness I scrolled through the comments first! Is there anyway to make this scarf and it not be so wide? 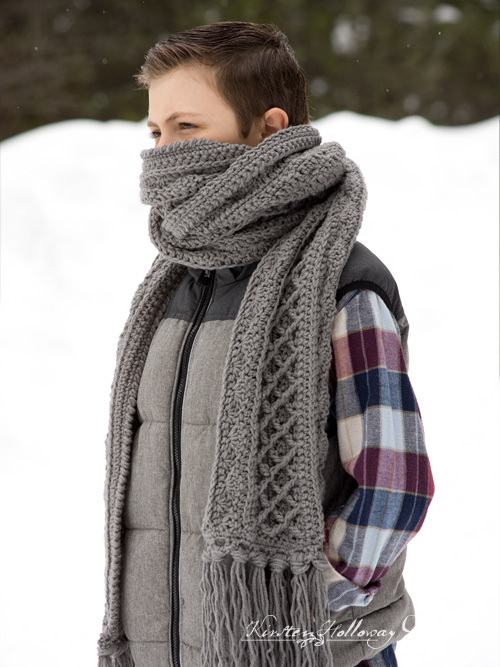 I’d love to make this for my husband but he’s very picky and doesn’t want a scarf much wider than 4 or 5 inches. Due to the textured stitches the pattern would look drastically different if you tried to omit rows. You could potentially try to make this with a 4mm hook, sport weight yarn, and increase the length using the multiples I’ve provided. That would make it narrower. The texture wouldn’t be quite as prominent however, when using the finer weight yarn. Hi, I am making this scarf and I’m loving the pattern, but I am confused about row 11. I have made a FPtr around the second sc of row 9, and three sc on top of row 10 as my row 11. For the next FPtr do I take the sc used for the first post as “1”, miss two sc from row 9 and make the next pot around sc “4”, or take the sc used as the first post as “1”, miss three and make the next post around the fourth sc, which would essentially be “5”? If that makes sense? I did it the first way initially and it did seem to be working, but I worried that I was misreading the pattern and would mess it up for later rows. The first way you mentioned sounds correct to me! Good luck on the rest of the scarf! Wow beautiful scarf! I’m only a beginner at crocheting do you ever sale these? I’d love to buy a few from you for Christmas gifts! So is row 5 supposed to be decreasing? It seems weird it’s all pulling and not staying flat. But I don’t see anything that says to chain one or two after each dc or slip stitch. Am I doing this wrong? You will be making shells in this row so the 5 dc in a single stitch should create a nice half-circle that should lay flat. If you’ve never worked the shell stitch before there are some good YouTube videos that show how to do it. 🙂 I hope that helps! Wow that was a fast response! Thanks I figured out I just can’t read! It say FIVE dc’s. I read it 20 times and am only now recognizing the five part! OMG…I guess I’m not as advanced as I thought I was…I got to row 11 and I am a little stumped. Do I put the sc in the 9th row or in the top of the 10th row? You mentioned adaptations for a hooded scarf. Where are they available, I am interested in making that version. Fold the finished scarf in half, texture side out and sew the two bottom sides at the center of the fold 12-15 inches or however deep you need the hood to be. This will create a “pocket” you can use for a hood. Hope that helps! 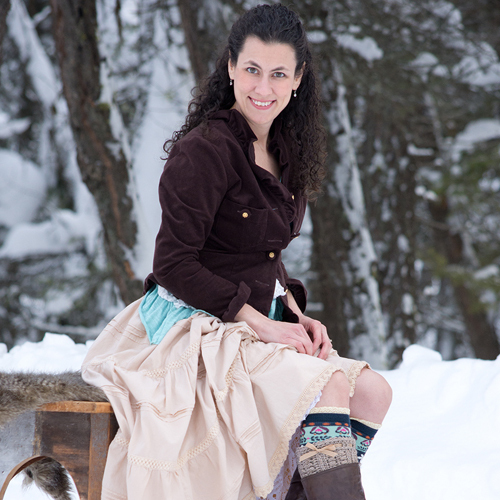 How can I upload a photo to show you the 2 scarves(and matching snow hats) I made with this fantastic pattern?! I look forward to seeing the pictures! First off I want to say that this pattern looks absolutely beautiful. Second, this is my first time doing a bit more advanced pattern but I’m bound and determined to make it. Im currently stuck on Row 5. When you say to do 5 dc are you meaning to do 5dc into the same stitch? Cause I guess I’m confused on if I do a set of 5 dc, each in their own stitch, skip two stitches, do a slip stitch, skip 2 stitches and do another set of 5 dc again in their own set stitches. I’m glad you like the design, and hope the above info helps you successfully finish this project! I’m having the same wrong side problem with row 11. I’ve gone back and decided the only way I can fix it is to add a row of single crochet as row 10. Where do you think I went wrong? You were probably working into the wrong side of the stitch if your ridge showed up on the wrong side. To fix it, redo the 3rd loop row working in the opposite side from what you did before. I must be an idiot, I have started this scarf 4 times now getting as far as row 11 once. Now I’m struggling to get past row 6 with my correct count, I seem to have 4 extra stitches now and it’s been that way the last 3 times. I’m not completely sure what’s going on either. Rows 6 and 6 are the shell stitch, and row 6 has 2 half shells, one on each end with only 3 dc in them. If you’re putting 5 dc in the end shells that could possibly be how you’re ending up with 4 extra stitches. Thanks for your reply, I figured it out. Now I’m having the same problem with row 11 as I’ve seen previously. I was so careful of my count since rows 5 and 6 that I know I worked into the correct third loop but row 11 is going to be on the wrong side if I continue. I’m about ready to give up, this has been one of the most frustrating things I’ve ever crocheted and I’ve been doing this for almost 20 years. I’m sorry to hear you’re having so much trouble figuring it out. Work in the 3rd loop on the opposite side of the stitch than you just did and all the texture should come out on the proper side. Hi, I read where you say the pattern is a 12+1, but I think I’m missing something. The original instructions say chain 254…and that would be a 12+2. I’m lost. Help!